We are not responsible for errors you make. We make enough of our own!! Note: You must fill in this page for each item you want engraved! If your item has UNDER 20 letters, use this button. There is a minimum $10.00 set up charge for 1 to 20 letters. NOTE----- All over 20 are $ .50 PER letter ! ! Remember....the more you put, the smaller the type will be! If your item has OVER 20 letters, use this button. Now... in the shopping cart, change to the number you have typed. The price will adjust accordingly. If this is confusing (and I can see where it would be!) 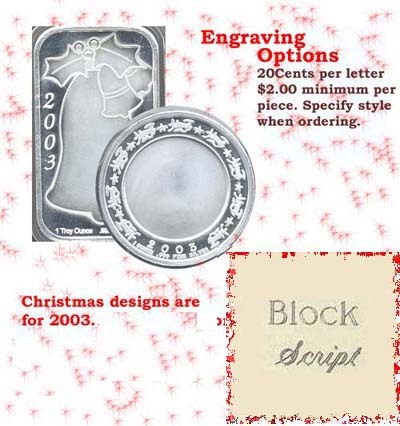 just email me before you order to find out what your engraving will cost if you want to be certain. for up to 20 letters!